High quality bodybuilding and fitness gloves from Proworks; made from 70% SBR rubber and 30% Dacron polyester and available in several sizes. Offering a comfortable, effective grip; these workout gloves are a great alternative to standard hand wraps for free weights, dumbbells, barbells and other pieces of weightlifting and strength training equipment. Not into lifting weights? Don’t worry; these gloves are great to use with your rowing machine, cross trainer, elliptical and exercise bike. They’re also perfect for your indoor and outdoor yoga sessions if you don’t have a mat. If you’re put off using a pull up bar, dip station or bench press because of calluses, these ladies crossfit gloves can help reduce the friction on your hands to prevent them from forming. Medium size female glove dimensions: 145mm Length ¦ 95mm Width ¦ 5mm Thick. 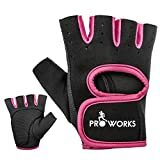 New from Proworks, these professional womens exercising gloves are the best piece of sports wear apparel for all your home and gym work out routines. Their tough rubber grip ensures they can be used with most exercise machines, balls, bars and mats. Improve your strength, conditioning and general fitness by taking your workouts to the next level! Add push ups, sparring, powerlifting or kettlebell exercises to your routines to keep your body working at it best. These gloves can be used for all of these exercises and more. Proworks is proud to offer you the best girls work out gear and sport accessories. Stylish, cute and functional; these sporting gloves are a great replacement for standard hand grips when working out.